Beautifying oneself is dream of every person. This matter is more important for females and they are ready for spending heavily on different beauty products. According to reports, on average a woman spends $15,000 on makeup in her lifetime. With the passage of time, new technologies are evolving that are bringing improvements in beauty and makeup field as well. Now women are more engaged for permanent solution of their beauty management and wants complete change of their appearance (skin, hair, nails etc.) according to their liking. Fortunately, this solution is available now with the advent of modern field of cosmetology (skin treatment). Cosmetology includes all types of beauty treatments related to skincare, manicure/pedicure, hairstyling, hair removing, cosmetics etc. These professionals receive special licenses from relevant authorities to practice their skills. Due to advancement of this field, people are getting specialization in various sub fields of cosmetology. This type of application brings temporary or permanent changes in body structure (skin, hair, nails etc.) of a person. Being a modern international city, Dubai has adopted almost everything from modern western nations. Lifestyle of Dubai is a beautiful blend of local and foreign culture. Many people in Dubai are ready to use expensive procedure for more attractive looks. Despite the fact that fee of beauty salons are high, there is no shortage in formation of new salons in various parts of Dubai continuously that provide different medical treatments to their customers. It is because of the high lifestyle of people of Dubai and their urge to look beautiful at any cost. This clearly means that Dubai is a lucrative place for professionals related to cosmetology. In order to get maximum benefit from Dubai’s market, these professionals need to setup a beauty salon in Dubai after getting appropriate license from authorities. After setting up their beauty business, these beauticians are allowed to provide services as mentioned in their license. As this is an important service regarding important body parts of a person, so only well qualified and skilled persons are given the license. Also, only particular services may be allowed for a license holder. 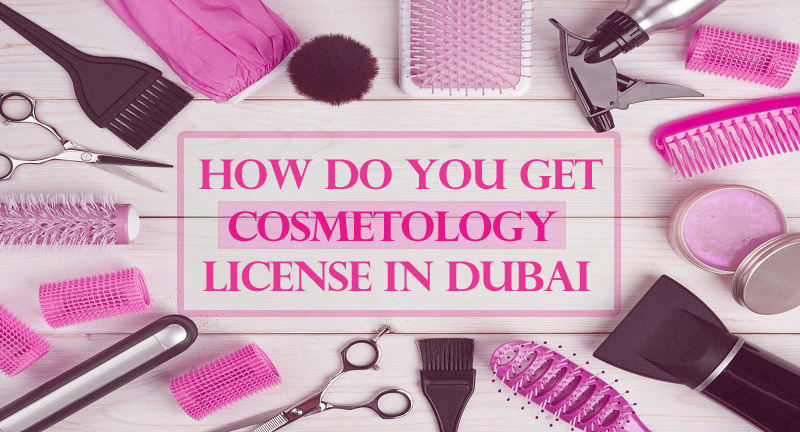 For setting up business related to cosmetology, professional license in Dubai is required. Obtaining this license will only require services of LSA (local service agent) instead of local sponsors for businesses and the foreigner can easily own 100% shares of her/his business. There are several departments that take part in preparation of cosmetology license for interested persons. Most important ones are Department of Economic Development (DED) and Dubai Municipality (DM). The applicant is required to submit several documents in different government departments for successful proceeding of license approval process. Few of the important documents include passport and visa of business partners, tenancy contract, Ejari number etc. Obtaining cosmetology license is the most important step for specialists of this field for setting up their business in one of the world’s most profitable markets of Dubai. We at Riz & Mona Consultancy can make this process easier for you by completing all these tasks ourselves without anything to worry for you. You only need to contact us via WhatsApp # 971-56-9971225 and hand over this job to us.